Bring MMF to your campus! MMF would be honored for you to spread the MMF Message on your campus! Over one million individuals across the U.S. lose their ability to complete basic muscular movements. The ability to walk, talk, swallow, breathe, and engage in desired activities may quickly come to a heartbreaking end. Students, athletes, clubs, and student-body organizations engage in community service learning projects, organize, fundraise, and raise awareness to directly assist Muscle Movement Fdn. (MMF) Muscle Champions in need! -Start a MMF school club. -Host a 5k on campus. -Propose our cause to your coach. -Start a team fundraising campaign. -Sell MMF gear at school. -Start your own fundraising campaign. -MMF logo on team uniforms. Students at Ohio State University construct a wheelchair ramp for a local MMF Muscle Champion. The Student Nursing Association at Neumann University (PA) invited MMF Founder, Rob DeMasi, to speak! Salesianum School (Wilmington, DE) hosted a video game day for MMF Muscle Champions! St. Elizabeth School (Wilmington, DE) invited a MMF Muscle Champion to their home football games and sold MMF apparel! Students at Ohio State University completed a wheelchair accessible path for a local MMF Muscle Champion in need! 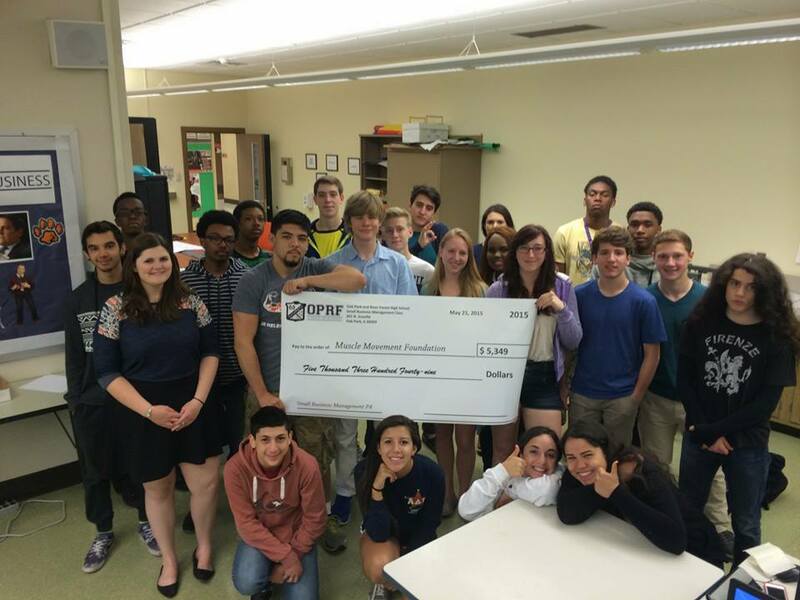 Students from a business class at Oak Park River Forest High School (IL) chose MMF for their end of the year project! Students at the University of Delaware set up a MMF booth at a wrestling tournament! Students at Ohio State University hosted a MMF Run for Strength 5k on campus! MMF Muscle Champion, Eddie Hazeldine, inspired his fellow classmates at Henry B. duPont Middle School (DE) to join his wrestling team's fight against muscle disease! MMF Muscle Champion, Mike Smith, has started a MMF Club on the campus of Wilmington University (DE)! Students at the Ohio State University hosted a MMF Run for Strength 5k on campus! Alumni from Saint Mark's High School and Salesianum High School (DE) joined in a flag football game to benefit MMF! Members of our US Army requested a MMF banner to raise awareness in Afghanistan! Designing and selling MMF apparel on campus is a wonderful way to raise awareness and support for MMF! A local news station interviewed Dominic Cicconi, the President of the MMF at Ohio State! Salesianum School (DE) hosted a video game day for MMF Muscle Champions! Marbrook Elementary School (DE) invited MMF Leadership Members to attend their open house! Students at Wilmington University (DE) enjoyed stopping by the Italian Kitchen at Wilmington University to purchase a MMF shirt and snacks to raise donations for MMF! Conrad Schools of Science (DE) joined MMF's Charity of Champions Program and honored Muscle Champions Eddie Hazeldine and Josh Wallace as their home game captains! St. Elizabeth School (DE) welcomed MMF Muscle Champion, Max French to a family home game!